In examining my sources of information, I have adopted the attitude of friendly hostility. It has been my experience that most of the errors in the difficult task of interpretation—which, after all, is the most important in any book—spring from the scholar’s uncritical attitude. He takes for granted that the fame of an author is sufficient guaranty of reliability and competence. Such mental outlook smacks of hypocrisy and cowardice. I have, therefore, dismissed this line of reasoning as inadequate. In this book, I have subjected my sources to a severe scrutiny, looked for loopholes, inconsistencies, and inaccuracies in order to arrive at a balanced conclusion. Ricarte, for instance, hitherto regarded as incontrovertible, is, after a careful examination, not always accurate and reliable. So is General Pio del Pilar. So are certain documents on the trial and death of Bonifacio. And so are some of the opinions expessed by the great scholars Epifanio de los Santos and Teodoro M. Kalaw. I shall probably hear loud protests and whispered innuendos, but I invite the potential objectors to my method to read my notes carefully, for in them I have embodied the reasons for repudiating some of the claims of famous scholars, for dismissing this authority, and for accepting that document. — T.A.A. Eminent historian, poet, short story writer, editor, and professor, Teodoro A. Agoncillo was born in Lemery, Batangas, on November 9, 1912. He earned his Bachelor in Philosophy degree in 1934 and Master of Arts in 1939 at the University of the Philippines. He was conferred the degree of Doctor of Letters, “Honoris Causa,” by the Central Philippines University in 1969; Linguistic Assistant, Institute of National Language, 1951–1956; Department Head, Department of History, 1963–1969; Rafael Palma Professor of Philippine History, 1973–1976, and University Professor, 1976–1977, University of the Philippines; Academician, National Academy of Science and Technology, 1980; and Commissioner, National Historical Commission, 1967–1985. 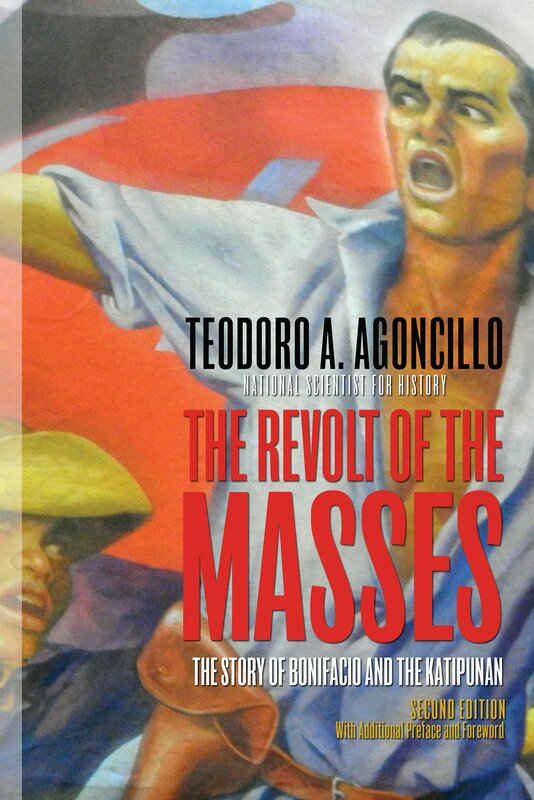 His distinguished books are History of the Filipino People, The Revolt of the Masses: The Story of Bonifacio and the Katipunan, Malolos: The Crisis of the Republic, and The Fateful Years: Japan’s Adventure in the Philippines. His outstanding works in Philippine literature are Bahaghari’t Bulalakaw and Sa Dalampasigan at Iba Pang Tula. He received the First Commonwealth Literary Contest Award in History, 1940; First Prize for the Republic Contest on Bonifacio and the First Epoch of the Revolution, 1948; Carlos Palanca Memorial Award in Philippine Literature for Short Story (Tagalog division), 1953; Philippine Historical Associations Award for his outstanding books on history and literature, 1975; the Diwa ng Lahi Award from the City of Manila, 1982; and the posthumous award as National Scientist in 1985. He died on January 14, 1985.